Compared to its widespread implementation across almost all areas of production, Lean improvement efforts lag within the process industries. While, a number of innovators have successfully applied Lean principles to these industries over the last two decades, most of those pioneering efforts were never recorded to guide the improvement efforts of others. 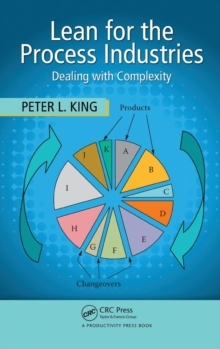 Drawing on 40 years of application experience at one of the world's largest chemical and materials manufacturers, Peter King corrects this void by providing the first comprehensive resource written explicitly for change agents within the process industries. Focusing on areas where the improvement needs of the process industry differ from parts assembly manufacturing, Lean for the Process Industries: Dealing with Complexity -Covers each of the eight wastes commonly described in Lean literature, looking at how they manifest themselves in process operationsExplains how to adapt value stream mapping for process operationsShows how to identify the root causes of bottlenecks, and systemically eliminate themProvides process-oriented modifications that will enhance the usefulness of Cellular Manufacturing, Heijunka Production Leveling, and Pull Replenishment Systems Discusses the role of process operations management in a Lean strategy Whether you are manufacturing consumer products such as foods, paints, and pharmaceuticals, or materials such as bulk chemicals, sheet goods, and synthetic fibers, this book shows you how to achieve that enviable level of performance where continual improvement becomes inherent to your processes.